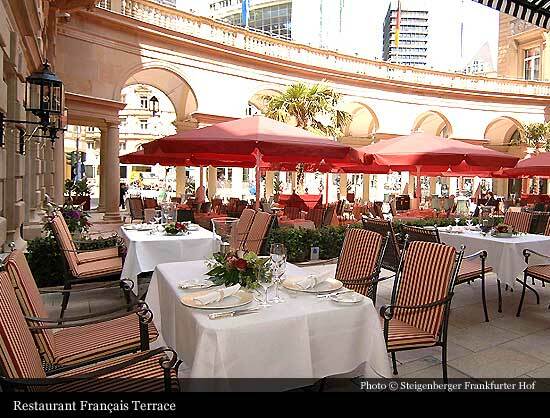 With the formation of the stock company “Frankfurter Hotel-Aktien-Gesellschaft” the foundation stone of the future hotel was laid on 29th October 1872. 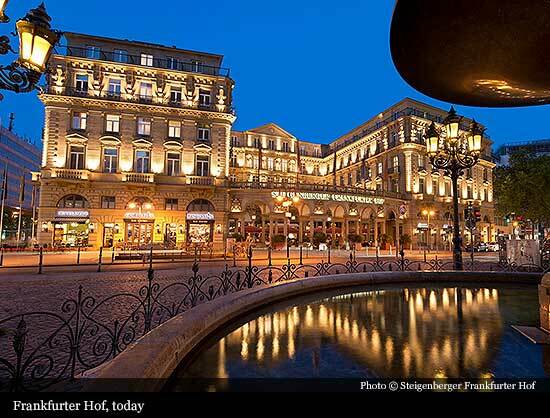 Four years later, on the 26th of June 1876 the grandhotel with the name „Frankfurter Hof“ opened its doors with a large ceremony. The impressive new building was built by the architects Mylius and Bluntschli, offering its guests 250 rooms (350 beds), 20 banquet rooms, a large dining hall created for 800 persons, elevators, steam heating and a spacious kitchen with 6.5 m high ceilings. 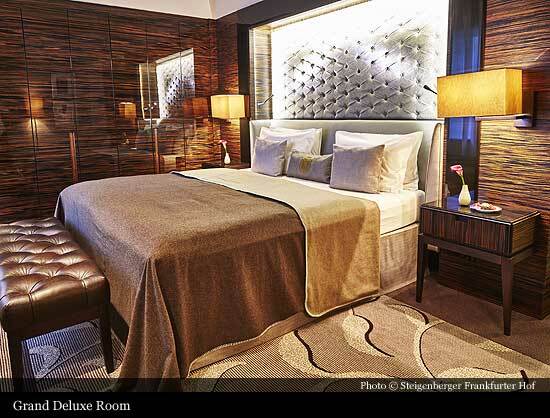 New hotel astonished its guests as well as hoteliers from all over the world. 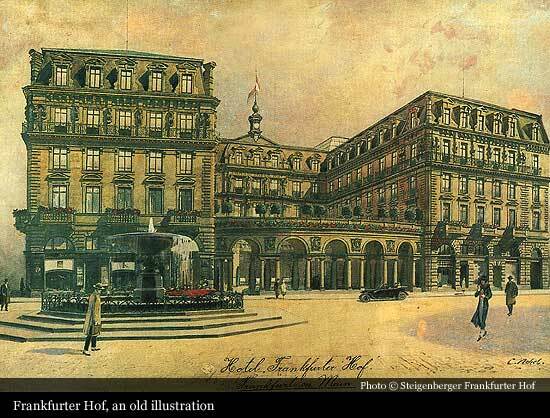 The “Frankfurter Hof” owned the first public phone in Frankfurt, and since the 1892, the first electric lightning. 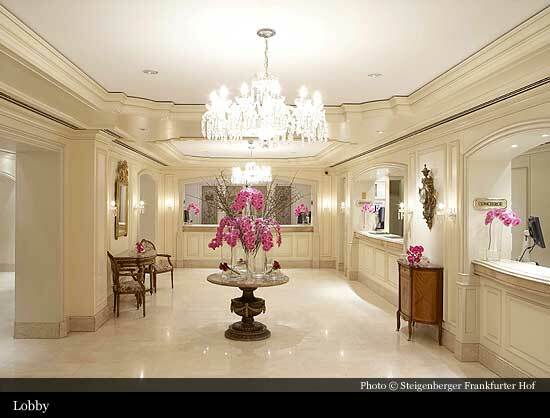 In the same year the hotel company decided to lease the “Frankfurter Hof” to the well-known Swiss hotelier César Ritz. 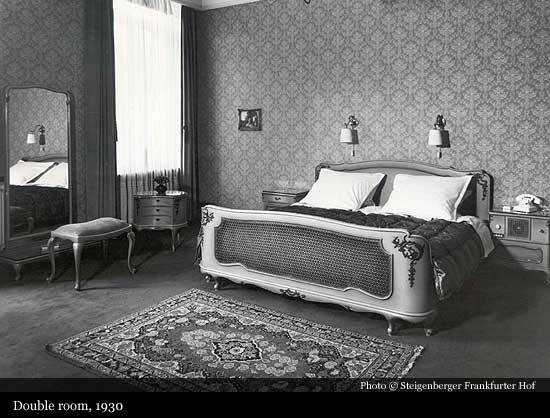 Until the beginning of the Second World War the number of guests rose constantly and even during the war the “Frankfurter Hof” existed as a platform for international guests and was not occupied by the NS-Regime. 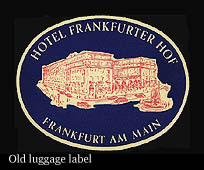 In 1940 Albert Steigenberger, owner of the hotel “Europäischer Hof” in Baden-Baden purchased stock majority and took over the management of the “Frankfurter Hof”. In March 1944, after frequent bomb attacks, the Hotel burnt out and only the facades could be saved. The restart followed 4 years later in an adjoining building with 20 beds. 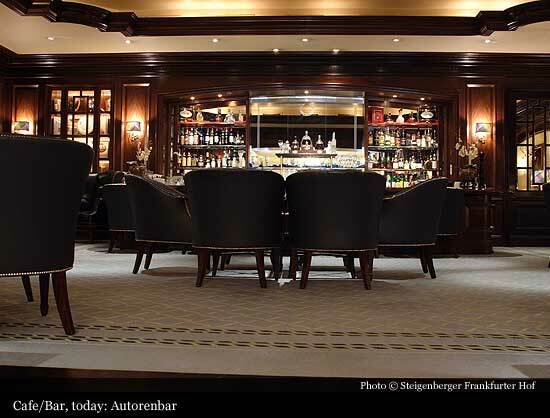 On January, 1st 1951, Albert Steigenberger founded the A. Steigenberger Hotelgesellschaft KgaA. 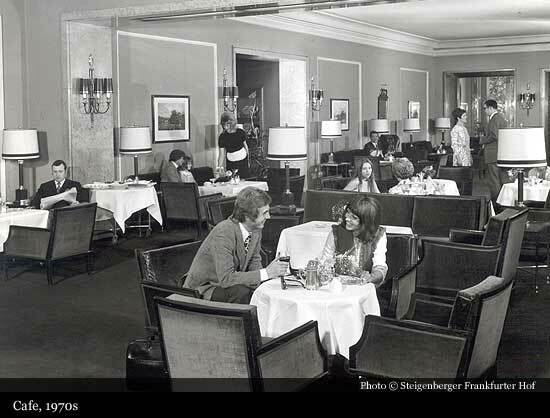 In 1958 Egon Steigenberger inherited the hotel from his father and under his leadership the “Frankfurter Hof” gained back its excellent position in the international hotel industry. 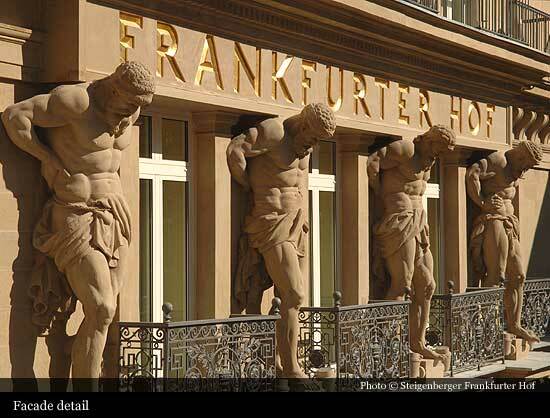 In 1961 the “Frankfurter Hof” became the largest hotel in the Federal Republic of Germany. 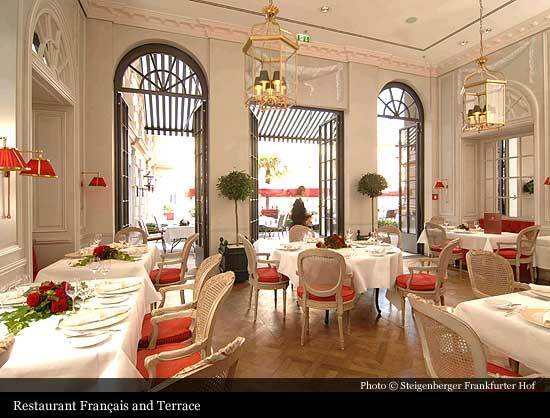 Since 2009, the majority shareholder of Steigenberger Hotels AG. is The Egyptian tourism company Travco Group International Holding S.A.E., one of the largest tourism companies in the Middle East operating hotels, Nile cruise ships and a complete range of tourism services. 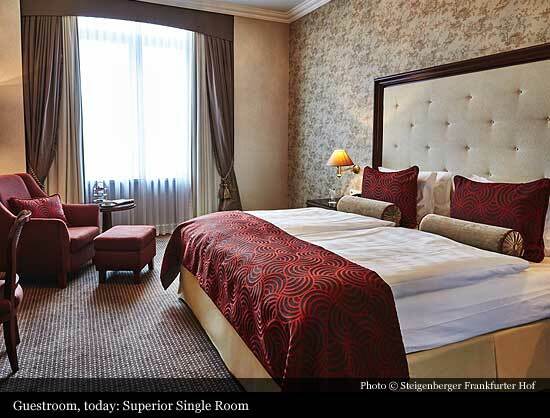 Throughout the years, the flagship hotel of Steigenberger Hotel Group has been refurbished continuously, with the latest one completed in June 2006.